Bounty hunters nab people who skip their court dates and owe the company that posted their bail. 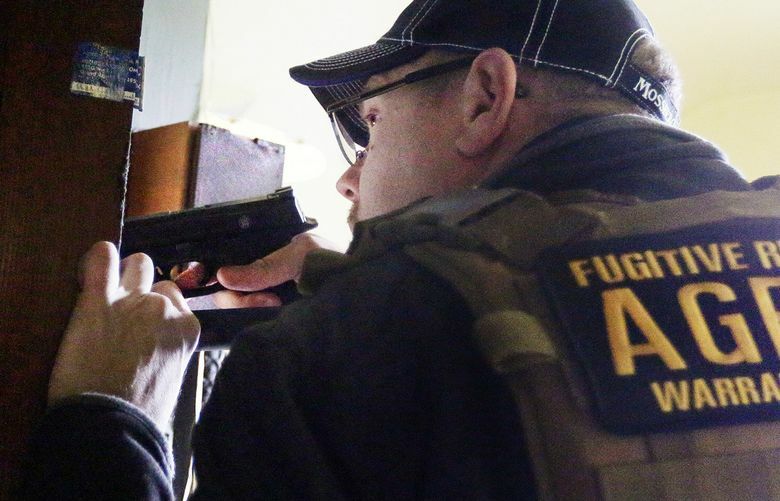 These agents, with the right to force their way into homes, are only very lightly trained and regulated — and some have a history of violence. The silver Hyundai appeared out of nowhere. It was still dark on the morning of May 20, 2016. Toni Schartow was driving a Ford Expedition, slowly exiting a parking lot in Federal Way. Her 30-year-old son was in the back seat along with some friends when the Hyundai suddenly blocked their path. The two men in the Hyundai jumped out. One wore a tactical vest with “Agent Warrant Division” emblazoned on it in big white letters. In the glow of headlights, he pointed a shotgun toward Schartow and without saying a word, he fired, sending a beanbag round through the windshield. He circled to the passenger side. “Shut that (expletive) vehicle off,” he shouted, and fired again as Schartow desperately tried to shift into reverse. 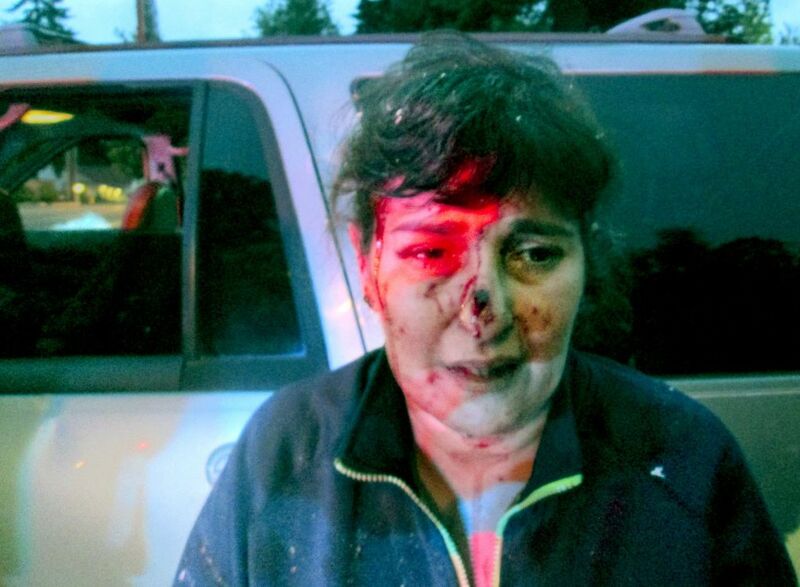 This time, rubber pellets ripped through the passenger side window, striking her in the face and hands. One lodged in her nose. Blood poured into the center console. The shooter was a former videographer and sheriff’s deputy turned bounty hunter named Scott Gribble, who operates one of the most prolific training programs for would-be bounty hunters in Washington state. His target that morning was Schartow’s son, wanted for jumping bail on a burglary charge. Gribble’s actions quickly drew the scrutiny of police and King County prosecutors. Though he told police he fired in self-defense, claiming Schartow tried to run him down, investigators said footage from his body camera showed otherwise, and he was charged with third-degree felony assault. State regulators also took notice. Facing disciplinary action, Gribble agreed to surrender his bounty-hunter license for 10 years. 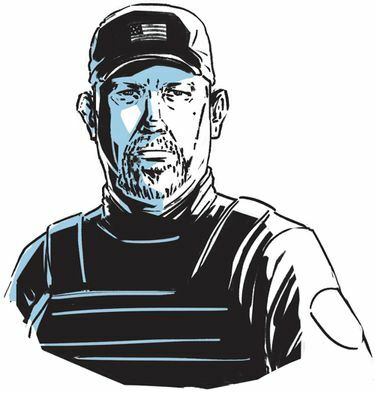 None of that, however, has kept Gribble from continuing to train the next generation of bounty hunters across Washington and other states through his company, Bounty Hunter Bootcamp. His continued involvement in the trade underscores Washington’s limited authority to regulate the high-adrenaline industry of bounty hunting, despite efforts to rein it in. Formally known as bail-bond recovery agents, bounty hunters frequently carry firearms and have the right to forcibly enter homes and apprehend people who jump bail. Yet getting a license is relatively easy, and hardly anyone is turned away — even if they have a history of violence, a Seattle Times investigation has found. In 2016, a bounty hunter shot and killed a fugitive’s mother in Graham, Pierce County, in a botched apprehension attempt. The bail-recovery agent in that case had received a license despite three previous arrests for domestic violence and harassment. That same year, three bounty hunters armed with guns and tear gas stormed a motel room in Spokane, sending other guests fleeing and illegally detaining an occupant who was not their target. One of the bounty hunters had been charged with crimes ranging from aggravated battery to resisting arrest, and had a felony conviction for grand theft that was later vacated — all before he was granted his license. He and another bounty hunter pleaded guilty to criminal mischief in the hotel case; the third was acquitted by a jury. All three had been trained by Gribble. 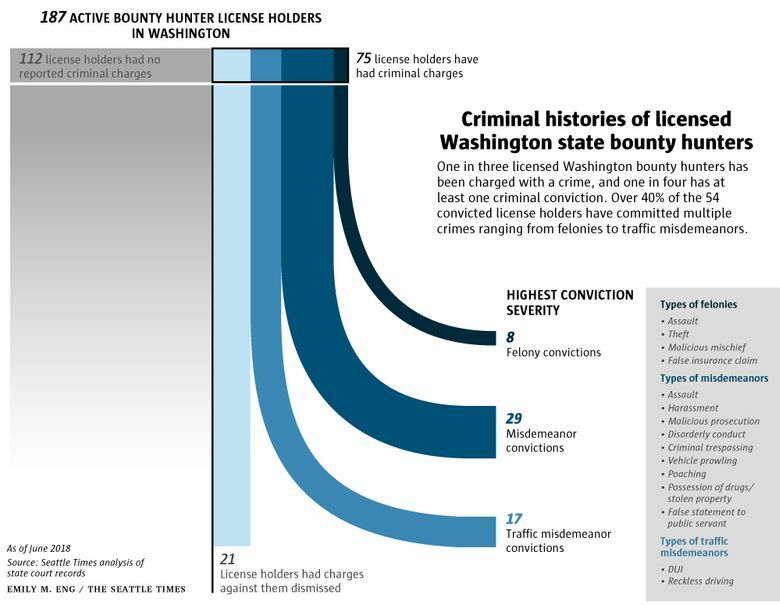 Washington state law does not prohibit people with criminal histories from becoming bounty hunters. Instead, the Department of Licensing reviews the legal histories of applicants case by case to determine whether they should be disqualified. As of June, the department had rejected only two out of nearly 400 new bounty-hunter applications submitted over the past decade. Of 187 licensed bounty hunters as of June, 75 had been charged with a felony or misdemeanor, most before they applied, a Times review found. Of those charges, nearly three-quarters led to criminal convictions that included felony assault, burglary, misdemeanor harassment, disorderly conduct and driving under the influence. 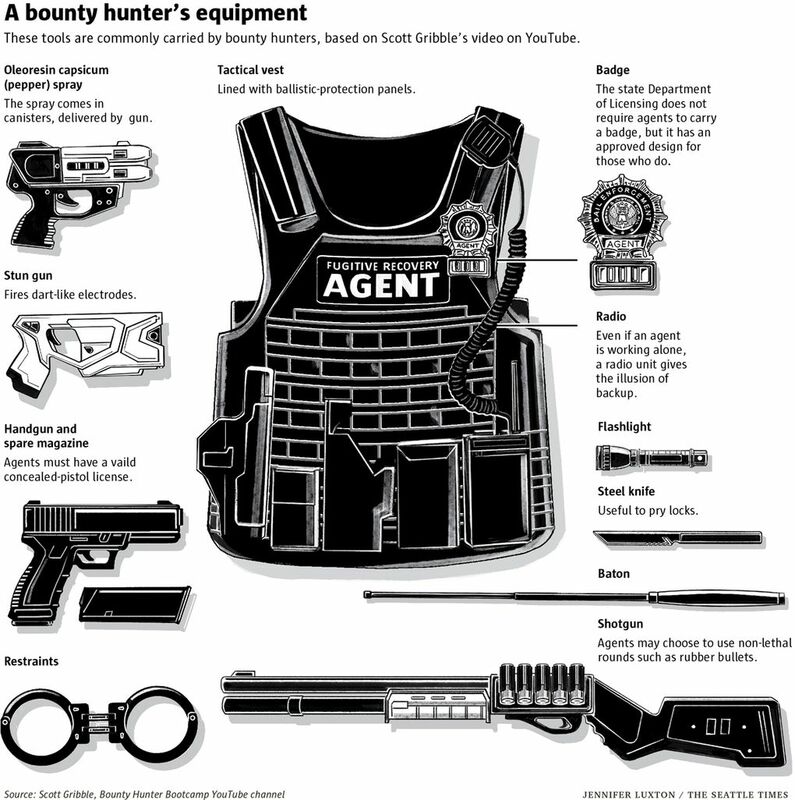 The lax requirements for bounty hunters are at odds with the weapons and tactics the agents are allowed to use. To get a license, an applicant must take 32 hours of training, which can include self-study, and must pass a 50-question, multiple-choice exam. The state has no formalized curriculum or certification process for instructors. Only the person teaching the firearms portion of the training is required to be certified through the state. By comparison, to get a license to perform manicures and style hair, a cosmetologist must receive 1,600 hours of training from a state-approved and licensed instructor. Schartow choked up with tears when a reporter told her that Gribble, who pleaded down to misdemeanor assault in the case, was still operating his bounty-hunter school. “The state should not allow this guy to train other bounty hunters,” she said. Schartow, who has filed a lawsuit against Gribble, said she still has glass shards in her face and suffers from PTSD. “I am afraid to leave the house. I see him in the crowd,” said Schartow, who has a visible scar on her nose from surgery to remove the rubber pellets. The DOL has authority to keep people who have been disciplined from operating in the state, said Christine Anthony, a department spokesperson. But agency officials say they have limited authority to regulate training or keep people with criminal histories out of the business. Bounty hunters have sweeping powers to apprehend fugitives, in contrast to police officers, thanks in part to the 1872 U.S. Supreme Court case Taylor vs. Taintor. They can enter homes without warrants; they can break down doors without knocking or announcing themselves; and they can transport fugitives across state lines without extradition orders. “The bail-bonds-recovery industry has been highly unregulated and very untrained,” said Brian Johnson, a professor studying the American bail-bonds recovery industry at Grand Valley State University in Michigan. In most states, commercial bail bondsmen and the bounty hunters they hire are an integral part of the justice system. When suspects are arrested, a judge can release them on their own recognizance or on bail to ensure they show up for court. If the defendants can’t afford bail, they can turn to private bail-bond companies, which will post it for them, typically for a fee of about 10 to 15 percent of the bond. If a defendant doesn’t show up for court, the company is on the hook for the full amount, unless it can apprehend the defendant and return him or her to court. That’s where bounty hunters come in. According to Johnson’s research, around 20 percent of fugitives skip bail on the national level each year, and when assigned, bounty hunters are able to recover 90 percent of the fugitives and typically keep 10 to 20 percent of the bond they recover. Four states, including Oregon, ban the commercial bail system and private bounty hunting by having law-enforcement officers perform bond recovery. Another four states bar private bounty hunters but do allow the bail-bonds company liable for the bond to go after the fugitive. Seventeen states have no licensing requirements. Twenty-six others, including Washington, assign varying government departments to regulate the industry, according to Johnson’s research and a review of state laws by The Seattle Times. The state Legislature passed a bill in 2004 requiring bounty hunters in Washington to be licensed. Among the tighter regulations in that legislation, bounty hunters are required to notify the local sheriff’s office before conducting a forced entry and must complete training in state and federal statutes and the use of various tools like batons, pepper spray, handcuffs and firearms. Johnson said Washington’s rules are among the toughest in the nation. Tim Manion, a former bounty hunter who retired in 2000, said Washington has come a long way. Still, there remain significant gaps. New York and New Jersey, for example, require applicants to have at least three and five years of law-enforcement experience, respectively. New York regulates who can train bounty hunters and approves the curriculum. That sort of rigor might have kept Mario Carey from receiving a license. A former Pierce County sheriff’s deputy, Carey became a bounty hunter after being charged three times with domestic violence and harassment in 2009. According to police reports, Carey allegedly punched and struck the girlfriend he lived with in the face, kicked her breasts and severely bruised her body on multiple occasions, leaving the home they shared covered with bloodstains. The charges were still pending when Carey refused to take a drug test and resigned from the sheriff’s office. His charges were eventually dismissed after he complied with a judge’s order to go through anger-management and alcohol treatment, and surrender his gun for two years, according to court documents. One month after getting his gun back in April 2011, Carey applied to be a bounty hunter. He received his license the following month. Five years later, on a chilly April morning in Graham, Pierce County, Carey was one of the three armed men who descended on Douglas Veale’s home. They burst through the front door in pursuit of Veale’s youngest son, who had outstanding warrants for a DUI and violating a no-contact order. Veale’s wife, Kathryn New, leapt up from the couch where she was napping. She ran to the bedroom and grabbed an unloaded pistol that Veale had given to her as a gift 25 years earlier, according to the police reports. Veale screamed at her to drop the gun while yelling to the bounty hunters that it was unloaded. The next second, he saw a blue flash coming from his wife’s left shoulder, when a bounty hunter behind her hit her with a stun gun. Then within half a second, a second bounty hunter, Carey, standing across the room behind Veale, fired two shots at her. The bullets ripped through the sofa into her stomach and chest. She died at a hospital five hours later. Carey told a detective from the Pierce County Sheriff’s Office that he feared for his life and thought New was going to shoot him, according to the police report. He was not charged. The state took no disciplinary action against him. His license remained active until it expired in June. Carey declined repeated requests to comment for this article. “At the time he applied, his background and criminal history were qualified to become a BBRA,” said Anthony, the DOL spokesperson. But a former regional operations manager of the bail-bond company said he never would have hired Carey had he known of his criminal history. The manager, William Thomas McLinn, said he assumed the state did thorough checks before issuing a license. The DOL’s latitude in granting licenses regardless of criminal histories can be seen in a review of its current license holders. 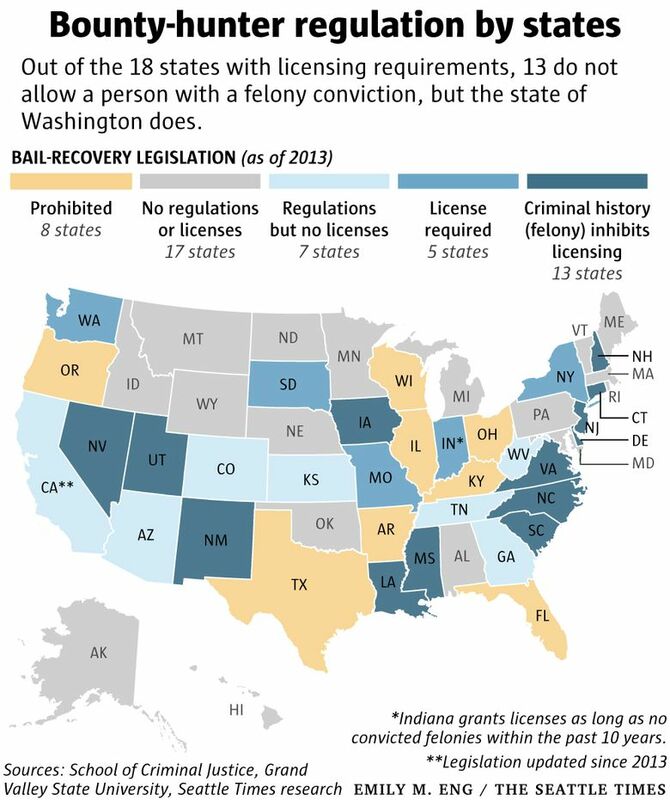 The Times found that 54 out of 187 current licensees as of June had criminal convictions — many had multiple convictions — before they were licensed. Eight of those had felony convictions for charges that included theft, burglary, assault and malicious mischief. One woman had five felony convictions and six misdemeanors between 1997 and 2016 before receiving her license. The rest had misdemeanor and gross-misdemeanor convictions ranging from assault and domestic violence to weapons violations and driving under the influence. State regulations say applicants can have no criminal convictions that directly relate to their ability to perform the duties of a bail-bond-recovery agent or that hinder public safety. But deciding what’s relevant for the job is subjective. For example, applicants are asked to provide criminal histories but specifically told not to include criminal traffic offenses, including driving under the influence, despite the long hours on the road looking for fugitives that the job can entail. At least 16 current license holders had records of multiple offenses of DUI, driving without a license and reckless driving. The DOL also does not consider a criminal conviction if it is later vacated or dismissed by a judge, even for a violent crime, nor can it look at arrest histories, only convictions, said Jessie Moore, investigation manager at the Public Protection Services office at DOL. “We have to operate with the statute of our rule and it clearly spells out that it must be a conviction,” Moore said. The Times also found seven bounty hunters who didn’t disclose convictions as required on the application form. The form stated that applicants failing to report a conviction may be denied for misrepresentation. DOL also does not run criminal background checks on active bounty hunters, but depends on complaints or self-reports from the agents, said Anthony. The Times found that at least 16 current agents have been convicted of crimes, including disorderly conduct, multiple DUIs and reckless driving, since obtaining their license. Fourteen of them had repeated driving offenses such as DUI, reckless driving and driving without a license. None of them have been disciplined by the DOL. Former state Sen. Adam Kline, who sponsored a bill that passed in 2008 increasing mandatory training hours from four to 32, called the department’s background-check system concerning. “The DOL needs to be very clear that no felony and violence-related convictions, even if they have been vacated, should be permitted,” he said. Kline said he also considers the current lack of training oversight troubling, and said the Legislature should strengthen regulations. Scott Gribble, who has continued to train students despite losing his bounty-hunter license, agrees. “There is no uniformity of curriculum or who can become an instructor in Washington state. I am here to professionalize the industry,” he said, adding that he thinks the 32 hours of tools training required under state law isn’t enough. The DOL no longer keeps a list of training programs, instead referring applicants to search the internet. Currently licensed bounty hunters reported receiving training from about two dozen programs or instructors, including Mario Carey. Gribble’s school was listed by a quarter of agents, making it the most prolific in the state. Gribble served stints as a sheriff’s deputy and a border-patrol agent in Texas before becoming involved in the media and local television-news industry in the early 1990s. 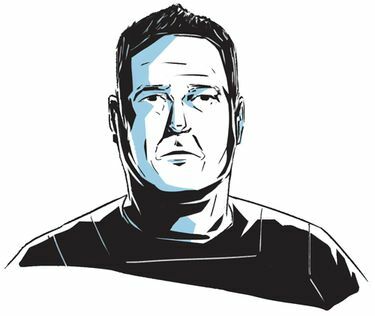 He became a bounty hunter after closing his own media company and filing for bankruptcy in 2010. His video experience has served him well in his latest career. He posts action-packed videos of his captures on his YouTube channel, which has nearly 50,000 followers, and uses them for training. His school, Bounty Hunter Bootcamp, opened in 2014 and offers classes ranging from 24 hours to 48 hours and costing from $450 to more than $1,250, according to his website. He charges $650 for the state-required 32-hour training, which includes courses on using a baton, pepper spray, handcuffs and firearms. His website lists upcoming classes in Washington, Idaho and Colorado and says future courses will be held in Detroit, Nashville and Atlanta. Gribble said his goal is to have the best bounty-hunter training school in the country. But his tactics have long drawn scrutiny from regulators and law enforcement. In the span of eight days in February 2012, he was accused of bringing unlicensed bounty hunters to assist in detaining a fugitive on two separate occasions. In the second incident, on Feb. 29, Gribble was accused of forcing entry into a Richland residence that did not belong to the fugitive he was seeking, representing himself as a police officer and pointing a weapon at the man who lived there. The man, who filed a complaint with the police, believed it was a gun; Gribble said it was a Taser and denied that he claimed to be a police officer. Gribble was charged with misdemeanor counts of trespass, assault, false reporting and impersonating a police officer. A jury acquitted him of the impersonation and assault charges in June 2013, and the prosecution voluntarily dismissed the other counts. The Department of Licensing determined that Gribble violated state law by enlisting unlicensed individuals to detain a fugitive and not exercising adequate care to protect the safety of others. In a settlement, the department suspended Gribble’s license for a year but opted not to impose the sanction in exchange for Gribble paying a $1,000 fine and agreeing to follow laws governing professional conduct. His classes have drawn praise from some former students, who cited his knowledge of state codes and the hands-on training. “My favorite thing is the hands-on experience,” said Quade Norush, who took Gribble’s course in 2016 but later lost his bounty hunter license after he was convicted of using his bounty hunter badge to impersonate a Washington State Patrol officer. Gribble defended his record: “I’ve got one conviction on a plea deal in 53 years. I’ve got one incident in 10 years that I’m getting sued for. That’s it,” he said, referring to Schartow’s lawsuit, which remains open. Gribble said he believes his run-ins with the Department of Licensing make his class even more valuable. “The fact that I’ve been through the wringer makes me a better instructor,” he said. 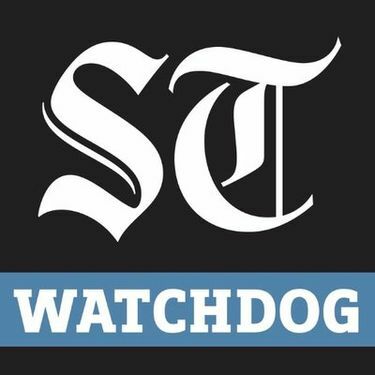 Seattle Times staff reporter Daniel Gilbert contributed to this story.